President Jonathan L. Stute, M.A. Jonathan Stute lives in Minnesota with his wife of 6 years and his son. 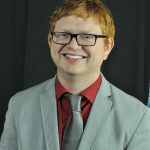 He has six years of experience in professional youth ministry which he just left in order to teach online at the University of Notre Dame and be a stay at home dad. He received a master’s degree in theology, focusing mostly in Sacred Scripture. After graduating from the Augustine Institute, Jonathan moved on to Holy Apostles College and Seminary to pursue a master’s degree in philosophy where his primary areas of study are natural theology, metaphysics, and atheism. He is in his last year of his MA in Philosophy program and plans to continue his studies at the University of South Africa and the Catholic University of Lublin. While at Holy Apostles, he founded an academic journal, hosts a radio show, contributed to the USCCB workshop on intercultural competencies, facilitated a partnership between Holy Apostles and the University of South Africa, and has served as a TA for several courses. In his fleeting spare time, he watches Korean TV with his wife and practices martial arts. Jonathan holds black belts in karate and tae kwon do and has been practicing jujitsu and MMA intermittently for about three years.